Powermat is a product most people reading this will have heard of. 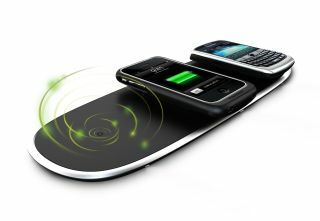 For those of you who don't know, it's a wireless charging mat that can charge up to 4 devices at a time. The mat plugs into the wall, and then you place your devices (such as your mobile phone or iPod) onto the mat, and it will charge them. It effectively cuts out the need for all those wires trailing everywhere, and looks really stylish and sleek. You simply need to put a receiver onto your device (either a case or a new battery door), and the Powermat will charge it. Furthermore, once the device is fully charged, the mat will 'power down' meaning you aren't wasting unnecessary electricity. The mat costs from £69.99 and the receivers from £29.99 (depending on device) and are available from John Lewis, Carphone Warehouse and Amazon.co.uk. This competition is now closed. The winner is Howard Mosley-Chalk.